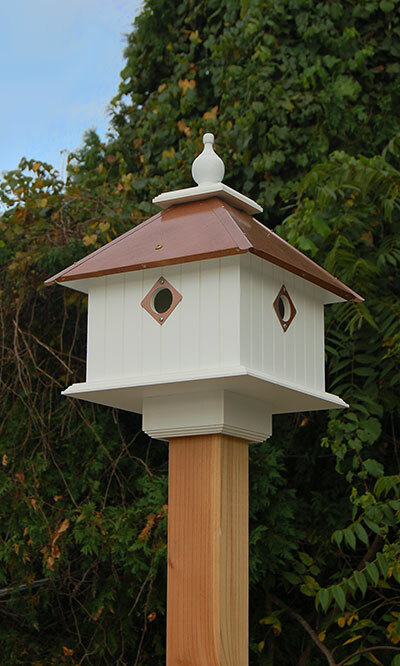 Establish a bird haven in your garden with this Wing and A Prayer Carriage Bird House. This classic home blends traditional styling with modern elements for a lasting abode. The home has four separate apartments, offering housing for several birds at once. Vertical lines on the exterior create the appearance of paneling on the sides for a realistic feel. A ledge around the base of the item lends fledglings takeoff or perching room, and the hammered copper colored metal roof protects the abode from the elements. A large white finial tops the piece to complete the look. A copper colored metal predator guard surrounds each 1.5" diameter entrance hole, preventing other birds from enlarging the hole and overtaking the house. Constructed of solid PVC trimboard, this house is designed not to mildew, mold, or delaminate with exposure to the elements, and will remain stable for up to 25 years. Use the preinstalled mounting collar to connect this home to a 4" x 4" post (not included), bringing height to the abode. The white color of the PVC contrasts the copper color on the roof, for a stylish roost. Invite several birds to live in your yard with this Carriage Bird House with Hammered Copper Roof. Made in the USA.